Iowa continued to report student proficiency rates significantly above those found by the National Assessment of Educational Progress (NAEP), according to a newly released follow-up analysis by Achieve, an independent education advocacy organization. Iowa receives the “Honesty Challenged” designation for reporting state proficiency rates that exceed NAEP by 39 percentage points in fourth-grade reading and 40 percentage points in eighth-grade math. If Iowa were to graduate all high school students fully prepared for college the state would save about $62 million in remediation costs and lost earnings. Nationally, developmental education costs students and taxpayers about $7 billion each year. Iowa’s Lack of Progress: In 2010, Iowa adopted college- and career-ready standards in English language arts and math. 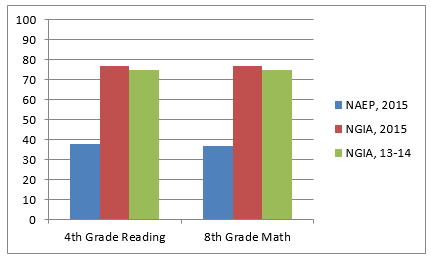 This spring, Iowa administered Next Generation Iowa Assessments (NGIA), which reported proficiency rates well in excess of those recognized by NAEP. While states officials should be applauded for adopting rigorous academic expectations, policymakers should tighten the state’s definition of proficiency. By doing so, they will provide parents and teachers with honest information about how well prepared their child is to move onto higher level material based on college- and career-ready standards.